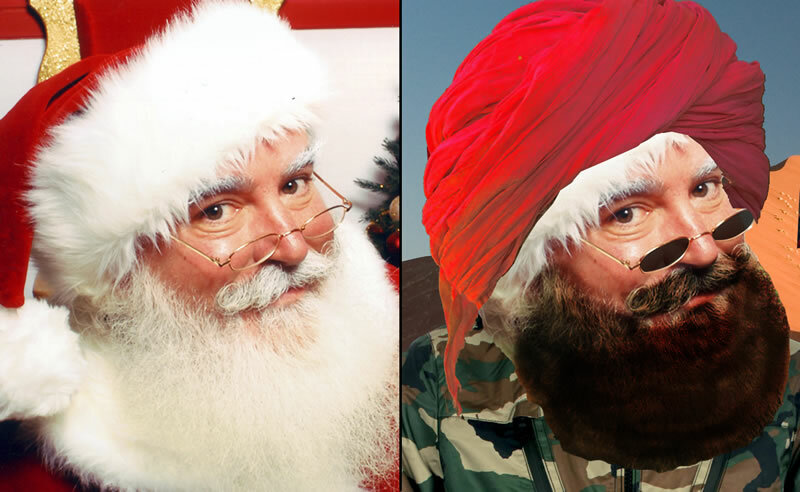 Washington, DC – The FBI is currently monitoring the threat of Santa’s radicalization through the popular image editing software: Photoshop. Concerns were raised across the country after multiple individuals witnessed the similarities between Santa Claus and the general profile of a ‘radicalized’ Muslim, which includes a beard, a cap, and the likelihood of flying an object onto/into buildings through the night. FBI Director Alex DeMarco, who has kept a close eye on the situation, recognizes the threat can be very real, and is worried that the software can fall into the wrong hands. “We’re deeply concerned that this software is highly accessible and can be obtained illegally, or perhaps even legally… if in the wrong hands the results can be disastrous,” said DeMarco, who is a twenty-year veteran of the bureau. DeMarco has deployed teams to conduct surveillance on any Santa imagery, an operation that includes monitoring postcards, online pictures, and large inflatable lawn versions of the favorite Christmas icon. Many right wing pundits have recently vocalized their skepticism of St. Nick, raising questions about his activities outside of the Christmas season. “I mean what does he really do when we’re not thinking about him January through October?” asks Alabama resident Mark Abraham. The FBI will continue to keep a close eye on the situation.